Beautiful yellow flower, with a dark heart and semi double to full double Intersectional Hybrid. With the soft Lemon smelling, large flowers will Garden Treasure be recommended for garden and city parks all over the world. Garden Treasure is easy flowering in the mid-late season and rich of flowers coming out of the dark foliage, enough to be wondered. 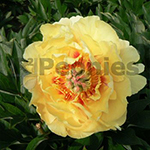 A Peony for solitary planting as well for large groups planting. Garden Treasure stays also after the blooming period attractive. The foliage gives in the fall, beautiful Indian summer colours.